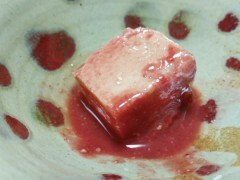 “Tofuyo” is made fermenting tofu for a long time with ‘benikouji’ yeast and awamori. This food has been an exquisite dish in Okinawa since the Ryukyu Kingdom era. It is said to taste like a mix of sea urchin and cheese, and its texture is soft and very delicate. Its scent is a bit pungent, but it complements awamori, beer, and wine very well as a side dish because its taste resembles cheese. Since tofuyo contains awamori, it’s not recommended for small children.